from maximum to zero in the manner illustrated means that its average velocity will only be slightly greater than one-half its maximum velocity. In other words, if this type of action were used in a short recoil gun, in spite of all the pains taken to achieve a high initial bolt velocity, the overall travel of the bolt would be accomplished at a much lower average velocity. To overcome this disadvantage, the bolt driving spring can be made relatively very light so that it offers a low retardation and will permit the bolt to move its entire recoil distance with little loss in velocity. In this case, the function of the driving spring is merely to provide a positive force which is just sufficient to insure that the bolt will close. Stopping the bolt at the end of its travel and reversing its motion can then be accomplished by causing the bolt to rebound from a so-called "backplate buffer5'. 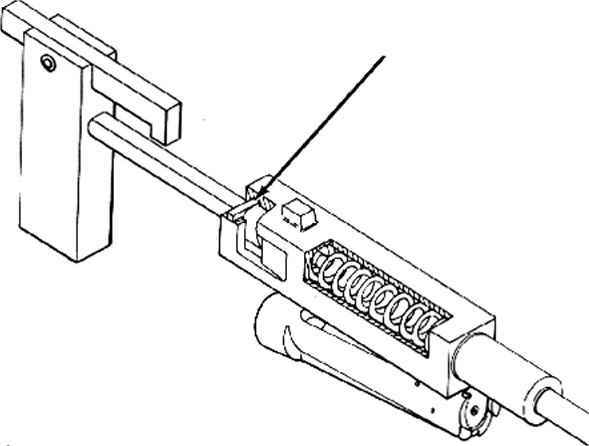 This device is in effect an extremely stiff spring which absorbs all of the kinetic energy of the holt over a very short distance and then delivers energy back to the bolt to propel it forward. The reversing action produced by the backplate is so abrupt that the effect may be classified as an elastic impact.